The Bright Band can be seen as the very dark region in RHI (Range-Height-Indication) scans (as seen in Figure 1). 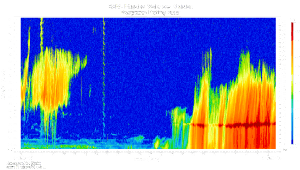 The power reflected back to the radar is related to the rainfall intensity and therefore radar beams striking this melting layer of snow causes overestimation of precipitation. Bright Band problems relate to the comparative reflectivity of particular object types (in this case, precipitation). 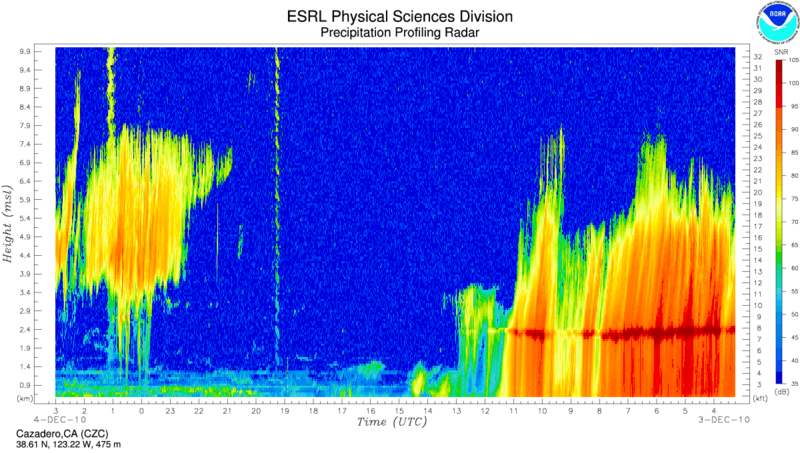 The supporting graphic shows the different stages of precipitation, leading to the bright band effect. It is normal for precipitation to first form at high levels in the atmosphere. In this region, the temperature is normally below the freezing point of water. The precipitation forms initially as a succession of very small ice crystals which begin to fall towards the earth's surface. As these high levels, ice crystals fall, they form larger ice crystals (or snowflakes). These flakes continue to fall as snowflakes in sub-zero temperature. At a certain point during its descent, the snowflake must pass through a point where the temperature rises above freezing point. At this stage it will start to melt. The initial melting will be to the exterior of the snowflake which will develop a water coating. However, water is approximately 9 or 10 times as reflective as ice to microwave energy. Therefore these large wet snowflakes will show a high reflectivity. The highly reflective melting snow will appear to the ground weather radar as more intense precipitation than it actually is. This is what is known as the bright band effect (an effect of high intensity of rainfall as it passes through the melting level). As the melting snow continues to fall, it further melts until it becomes pure rain. Raindrops are small and fall faster so both the size of the drops and their concentration is reduced. The radar reflectivity is then more realistic in terms of intensity of the weather seen. The Bright Band needs to be detected and corrected for. In addition to this, when estimating precipitation intensity, determining which hydrometeors (i.e. Rain and Snow) the beam intersects is crucial to the calculation.